Swapping Headblock ties on Peco Code 83 turnouts. Peco Code 83 turnouts come with the headblock ties extending off of the diverging side of the turnout. 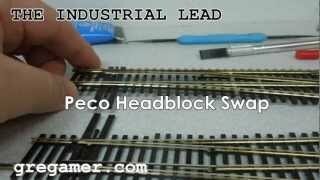 In this video I show my method for swapping headblock ties so that they extend from the straight side of the turnout. This modification may cause your spring wire to lose tension.